“Sweet Jesus” Ice Cream may only have a pile of melting nuts and sprinkles left after the heat of backlash, not just from Christians, but from the customers whose intelligence they’ve just insulted with some serious B.S. Worse, the response from CTV and Global National was to figurately sit straight faced through the bold-faced B.S. of the Sweet Jesus Ice Cream statement. Not even a literary smirk, like a, “com’n, you’re not serious right?” to let us know they weren’t buying it. Nothing. “So, you say ‘our aim is not to offer commentary on anyone’s religion or belief systems’ , and that ‘the best brands come from an honest place’, but that is clearly the inversion of what you are doing. Clearly you are offering commentary on Christian beliefs by using Christian religious symbols and quotations from the Bible etc. Do you think your company will survive with this kind of doublespeak? You just insulted my intelligence and that of your customers. Do you think this will win you customers? What did these icons of Canadian national news ask? Nothing. Nada. Who knows what is going on in the hearts and minds of Sweet Jesus Ice Cream. Did they think it was a clever Christian “baite and switch” marketing campaign? Was it a wink, wink, nudge, nudge, to some Christian baiters and haters out there: we all know what’s going on here right? The old “there’s no such thing as bad publicity game? 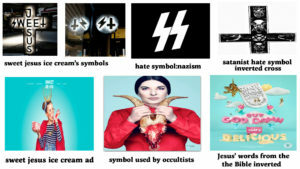 We’ll just milk it for all its worth: play the victim when the Christian backlash comes and rely on the public to choke down ice cream flavoured with satanic hate symbols and kids in occultishly suggestive images.